This King Ranch Cauliflower Chicken is a long-awaited post for me since I grew up loving the original king ranch chicken casserole. 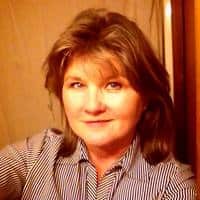 Since moving to a healthier diet I never wanted to go to the trouble or put anyone else through the trouble of making tortillas for the dish since low-carb tortillas can change texture easily in casseroles. After discovering that frozen cauliflower would replace the tortillas so well in this dish it didn’t take long for this low carb version to take shape and it is so very good and easy to prepare! This dish was originally published in September 2017 but I’m now updating it to include a video, nutritional info, and more cooking options so ENJOY! Full Disclosure: The original recipe was created many years ago and possibly at a place in South Texas called the King Ranch. There are lots of ranch seasoning chicken recipes around and I love them all, but this is not one of those. It is converted from the original King Ranch chicken recipe that has been a potluck winner for decades. 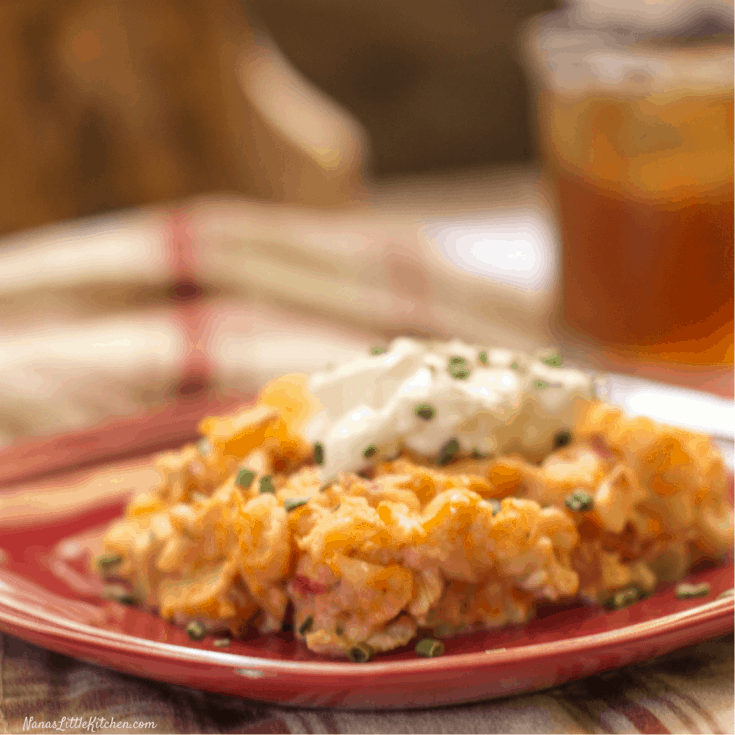 Besides being a delicious flavor combination it can be made ahead and reheated to taste as good or better than it was fresh from the oven, which is a very valuable quality in a casserole. This is a very kid friendly dish because the only spicy seasoning in this large dish is Rotel tomatoes that really lends flavor and not heat but can easily be replaced by mild Rotel if needed. I’m finding these delicious, easy to fix dishes like King Ranch Cauliflower Chicken make quick work of supper, but are also large and satisfying enough to feed a family or even an empty nest with plenty of leftovers. 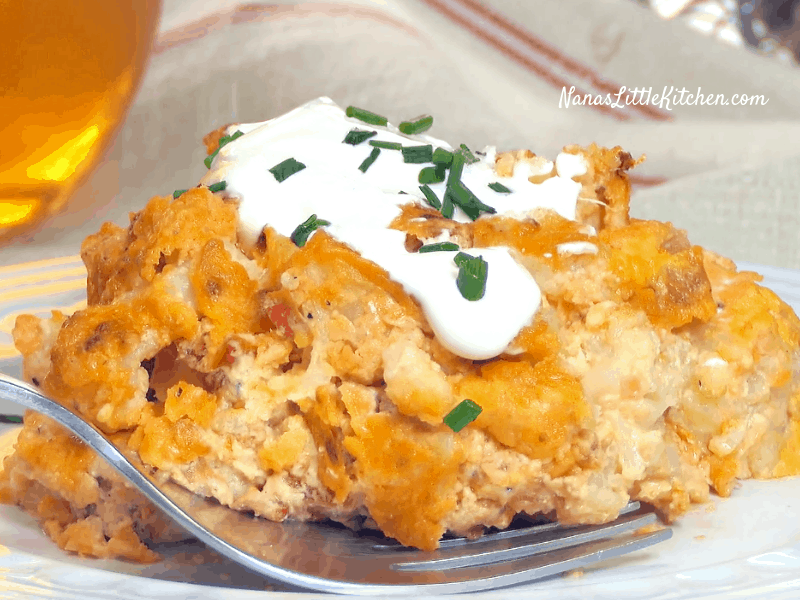 If you love cauliflower be sure and try the Buffalo Chicken No-Tato Casserole as well as the Bacon Wrapped Buffalo Cauliflower Bites. This casserole can be made as easily or as carefully as you’d prefer. I used a rotisserie chicken and microwaved frozen cauliflower for this dish but if you have the time and the inclination boneless skinless grilled chicken could be chopped up for this dish and fresh cauliflower could be used. I will update this recipe if I ever get to test it using those items. Preheat oven to 350 degrees and prepare for use a 13x9" glass casserole dish. Place frozen cauliflower in a large microwave safe dish and pour the chicken broth over the top and stir. Cook for 12 minutes or until fork tender . Add the cream cheese to the cauliflower and cook for another minute then remove and gently stir in the melted cream cheese. Next add the cauli/cream cheese mixture to the Rotel, chopped chicken, salt, garlic powder, and pepper stir in the shredded cheddar cheese. Transfer to an 13x9" oven-safe casserole dish. Bake UNCOVERED in a preheated oven for 30 minutes or until the casserole is a creamy, golden brown and excess liquid is absorbed. *The only trick to this recipe is getting the cauli fork tender in the microwave or oven precooking. It will continue to soften a little in the oven so don't overdo it but it won't cook thoroughly without the pre-cooking. If some of the frozen cauliflower heads are very large be sure and cut them in half with a knife after pre-cooking and before adding the cheese in. Could this be done in a crockpot? Using microwave on cauliflower. It’s so hot here in Florida I tend not to use my oven til winter months. I would think you could do it in a crockpot, but I’d cook it on high for a couple of hours and check it. If you leave it for long it could get mushy. Probably 4 hours on high max. Let me know if it works out and I hope it cools off soon for you there in Florida. Looks relish! Only thing I would add is the King Ranch is in Deep South Texas – not west, lol! Thank u for sharing your tasty recipes! How many calories are in a serving? I’m making for a friend and she asked me. She is doing a low calorie diet. Hi Brenda! I’m sorry but I don’t have calorie counts available. 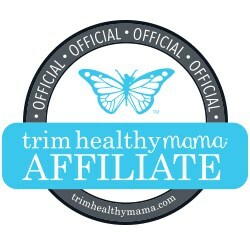 I follow the Trim Healthy Mama plan and we do food combining but don’t count the calories. Perhaps you can find a calorie calculator online and put in the ingredients? Sorry.